Dressers, children, party, and miscellaneous. Also, career & aspiration rewards are here, too. Countless postcards for your sims! special events, donate a sweet postcard to your loved ones! Unchain your heart and purse, and get caught into the postcards galore!!! This is a set of six postcard racks, each one coming with its own set of buyable and usable postcards; for a more good-looking placement of the postcards on the wall, a separated (optional) wall-mounted showcase is included; a diagonal version is also provided for each postcard, and for the showcase. The postcards can be bought from racks in any community lot, and can put for sale (in racks or as single cards) in commercial lots. 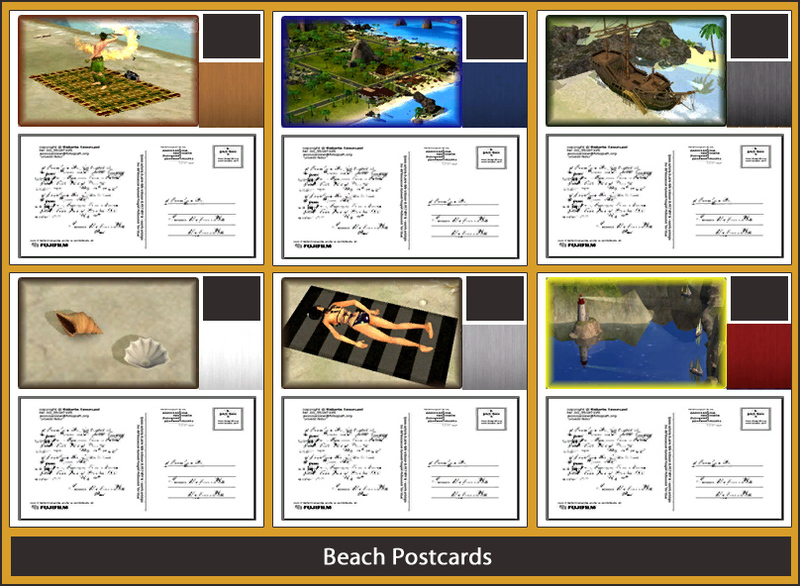 The purchased postcards can then be used as home decorations or given as a gift to other sims. POSTCARDS BUYABLE FROM RACKS - Unlike most of the decorative objects (including the small ones), that must be bought from the game catalog, you can buy the postcards only from the postcard racks, like in real life! 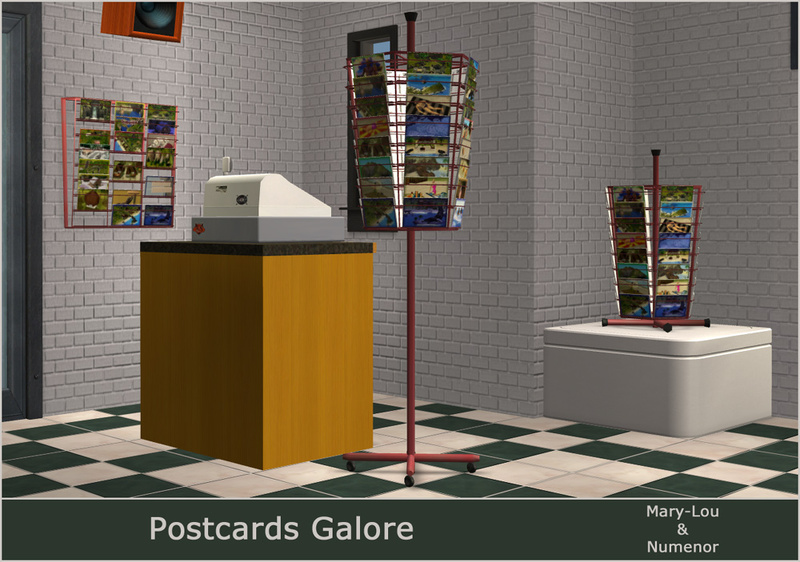 POSTCARDS SELLABLE IN SHOPS - Create your own shop and sell any kind of postcards! The Racks will automatically change their exterior look from "full" to "half" to "empty", while the customers purchase the postcards. AUTOMATIC MESH - The racks will automatically adapt their mesh to their placement: mounted on a wall, placed on the floor or installed over a counter or table, they will always look at their best! The same feature applies to the single postcards: whenever they are placed over a surface, an elegant metal holder appears to support them. GAME ADAPTIVITY - The postcards and the racks will take advantage of the Expansion Packs that you have installed: additional EPs enable additional functions, while keeping perfect backward compatibility! The racks allow numerous interactions and functions, but some of them require specific EPs (NOTE: with "EP" we mean an actual Expansion, not a Stuff Pack). Community Lots - Townies and playable sims can browse the racks and buy the postcards, that will appear in their hand and - after the payment at the cash - in their Inventory, too. Commercial Lots (owned by a playable sim) - All the sims can browse the racks and purchase the postcards, that will appear in the sims' hands and inventory. It is also possible for the lot owner to put for sale single postcards, placed over tables and counters, or attached to the wall; but in order to sell them, the owner must first go himself to an exotic destination or to a community lot to purchase them (this is needed only once: after the initial sale, the single postcards can be restocked at will). The shop owner can perform all the standard OFB interactions: offer objects to customers, restock, etc. While the sales go on, the racks will change their exterior look from "full" to "half" to "empty" (empty racks won't allow further sales until restocked). Commercial Lots (visited by a playable sim) - They work exactly like a community lot (see above). 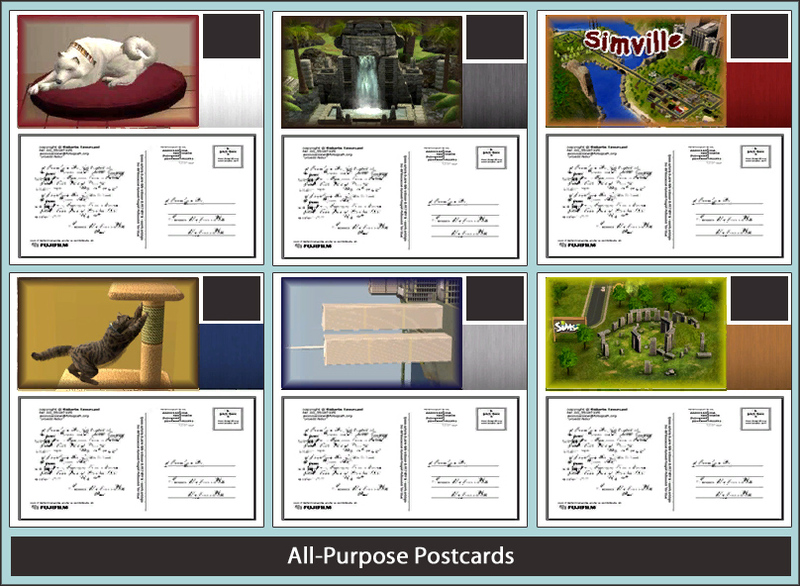 Residential Lots - It's possible to take the purchased postcards out of the sims' inventory, and use them to decorate the house, placing them on the walls (with or without showcase) or over tables (the metal support will automatically appear). It's also possible to place the racks themselves, into a residential lot: this way, it's possible to build a home business. Exotic Destinations - They, too, work like normal community lots, but with the difference that some racks can be used *only* in the "proper" destination (e.g. tropical postcards only in tropical destinations); racks placed in improper destinations will look almost empty, and a descriptive message will alert the buyers about the unavailability of those postcards. The postcards currently in the sims' inventory can be given as a gift to other family members or visiting sims. In this case, the main difference is that - of course - it's not possible to create and run business lots; as a consequence, the postcards can only be bought from the racks (it's not possible to sell single cards in community or exotic lots). Without BV, no exotic lots can exist; the "touristic" racks won't suffer for any limitation, and can be placed in any lot community or commercial lot. 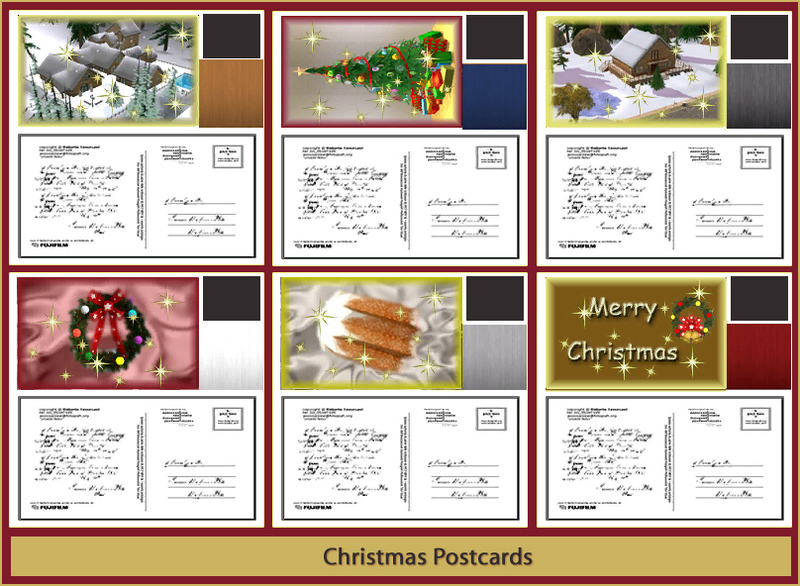 In this case, the racks can only be placed in normal community lots; the purchased postcards will be included in the sims' inventory, so that they can be used later on, as home decorations or as gifts to other sims. In this case, the sims have no personal inventory (it was first introduced with NL...); as a consequence, the postcards can't be purchased by playable sims. The townies will spontaneously buy postcards, occasionally, but they will be just fake purchases. The racks can be placed, of course, only in normal Community lots. Keeping in mind the limitations described above, the entire Postcards set is compatible with any game, including the base-game only; of course, the more EP you have, the more functions and interactions will be available. Very simple! Just unpack to your Downloads folder. If your computer hates rar archives, use the Q-Xpress. NO ZIP! For your convenience, the provided rar archives contain a sub-folder structure, so that you can just unpack everything to your Downloads folder, and the files will be neatly grouped in subfolders into your Downloads. Attached to this post, you will find SIX archives, each containing one rack and all the related postcards. They are completely autonomous: you can choose to download them all, or just one, and they will work perfectly fine in any case. ML-NMN_Postcard-Rack_Xmas.rar contains the "Christmas" set, another "fine art" set suitable for the upcoming holidays: cheers! NOTE: there is one single file, named "ML-NMN_Postcard_Accessory.package", that is shared between all the sets; for your convenience, we have included it in each of the six sets. Therefore, if you install multiple sets, it will be overwritten every time: it's normal and intentional, so just click Yes when asked. The racks have two separate recolourable subsets: the metal structure and the actual postcards. You can create recolours for one or both parts using Object Workshop: click "Open..." and browse to the rack; then, proceed as usual. All the racks already come with 5 different colours for the metal structure (except the Christmas rack that only has two colours). Moreover, we have created some "special recolours" for the postcard, to make the rack look not fully restocked (so to add some visual variety to the lots). Please note that the "special recolours" for the postcards can be used only in community and exotic lots: they are NOT usable in OFB commercial lots (in such lots, the texture is automatically managed depending on the stock level). 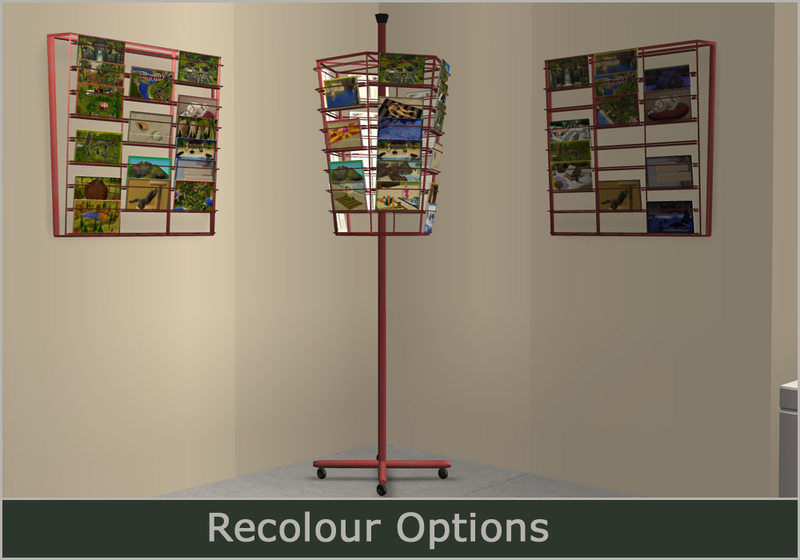 ATTENTION: Due to the frequent changes in the Maxis code, and to the complexity of these objects, the recolours can be picked from the catalog only if you have Seasons installed; without Seasons, you have to pick the default colour from the catalog, place the rack in the lot and then apply the desired recolour using the Design Tool. You can freely create recolours, and post them on any site, but DON'T INCLUDE THE MESHES IN YOUR RECOLOURS; post a link to this thread, instead. Like all our creations, we allow to include these objects in lots uploaded to completely free sites (NO EXCHANGE! ); however, BE WARNED that the game will NOT correctly include the entire sets (rack + related postcards + accessory postcard) in the lot: unless you are experienced enough to manually include in the .sims2pack the missing files, we strongly suggest that you remove any postcard-related object from your lots, and ask the users to download the postcard sets directly from this thread. Remember that it's FORBIDDEN to post the postcard sets separately from the lot (i.e. not included in the .sims2pack file); in any case, you have to grant credits to MaryLou and Numenor and provide a link to this thread (not just to MTS2!). F.A.Q. : Are these postcards really countless? Well, no, actually... But anyway they are too many to manage for a single sim!